Lieutenant Frank Travis, ventriloquist, gained fame after a successful tour of the continent in 1879, born in Yorkshire, he appeared on stage in military uniform, and was most famous for his Chelsea Pensioner figure, also it was claimed on his behalf that he was the originator of the feats of smoking and drinking while talking in a ventriloquial scena (The Performer, July 1, 1931). He was a huge favourite in Australia. Right - A photograph of Frank Travis - Courtesy Justine Sara. These type written memoirs were handed down through our family, along with some photos and newspaper articles, I have typed these up so the information in them is available to all who may be interested. My Grandfather was Francis Henry Thackeray, AKA Lt. Frank Travis's, last born child. I have transcribed the memoirs as accurately as possible, only changing obvious spelling mistakes and typos, if unsure I have left it as he wrote it, 27 type written pages handed down through our family - Justine Sara. 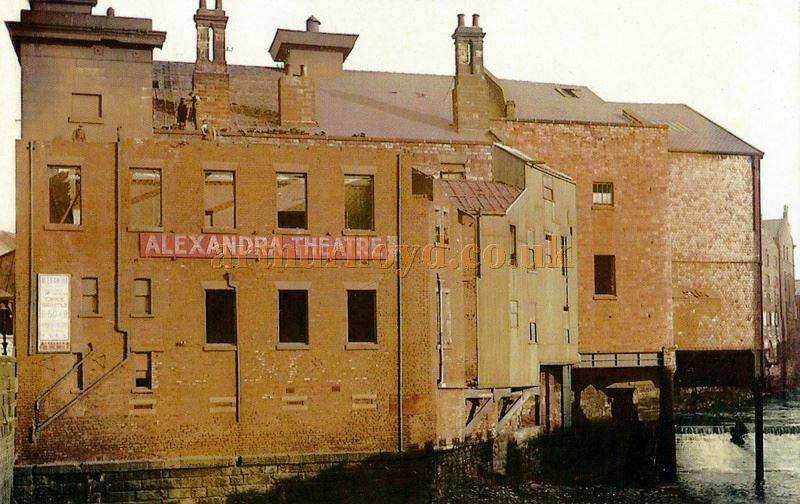 Above - A Postcard showing the Alexandra Theatre, Sheffield after it had been closed in 1914 and shortly before it was demolished for road widening - Courtesy John Mounsey. In the days when I was fighting against fortune I was glad enough to accept anything and everything that came my way, and thus it came to pass that once I joined a Barnstorming Company when I was in Sheffield. The crowd was made up of three or four actors who had just finished a stock season at the local Alexandra Theatre (shown above); one or two stage struck amateurs and four young ladies who had been in the ballet and who had to play small parts and dance between the farce and the drama. We met at the station on the Monday morning and it was agreed that each should pay his or her fare to to Wombwell where we were to commence operations, the fares to be paid as is usual by the Management after joining. So we started off in good spirits and duly arrived at our destination. When we had descended from the train and were waiting on the platform I asked where the theatre we were to appear at was situated, and in reply the manager informed me that no place had been secured but that we should go into the town (village I should have said) and see if he could find a Hall where we could act and said that I and one or two of the others had better wait on the platform and look after the luggage, which consisted of several parcels and one or two carpet bags. So we waited like patience on a monument for about an hour when he returned with the welcome intelligence that he had secured a large Clubroom in a public House and that he had told the Landlord that we were a portion of a Dramatic Company, and having a week out and being of a roving disposition, thought we would like to see the country villages. He had arranged with the "Boss" that we were to live in the house for the three days and that he would provide us with food during that time which was to be paid for at the end of the three days. So far well and good, and off we started to the Hostelry. Arrived there we took our "props" (save the mark) up to the room after which it was proposed that we should have some refreshment in the shape of bread, cheese, and beer. We readily consented to this proposition and with our sumptuous dejeuner over we commenced to see to business. First we went out and distributed handbills which had a blank space left at the top for the name of the Theatre, this space to to save printing expenses we wrote in with the necessary heading; next we hired a bellman to cry through the village the news of the arrival of our grand company of London actors etc., and then we set to work and erected a stage made of tables etc., and for side wings we ingeniously used a roll of wall paper which we cut up in lengths. The orchestra "specifically strengthened" consisted of a cornet, no more and no less. We dressed and made up in one of the bedrooms of the hotel, and the performance began, the room was full and the entertainment went well. 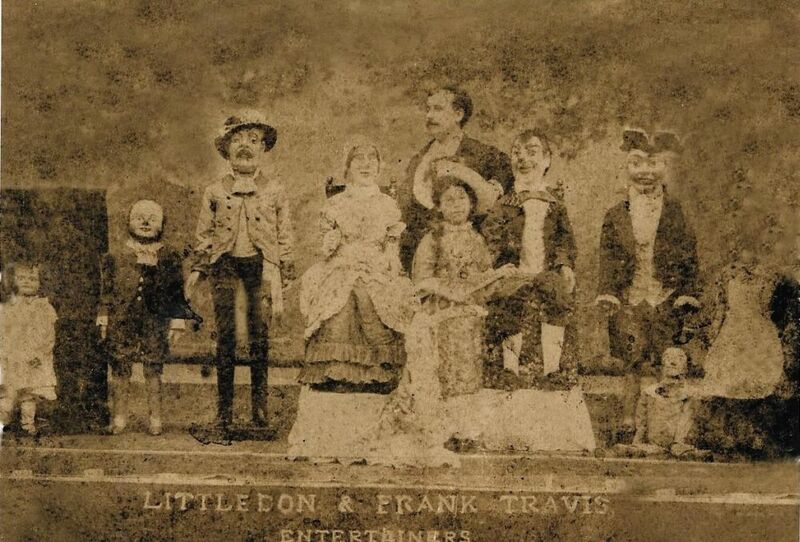 Left - Frank Travis with a small head figure, and a poster for Travis at the Argyle Theatre, Birkenhead in 1896 - Courtesy Justine Sara. After it was over the manager came and told us that the gross takings for the night were six shillings and eightpence, but that he expected business would improve. The next night we had five shillings in and the landlord began to get a trifle fidgety. I expect he was wondering how he was going to be paid, but our Manager told him that he expected a cheque on Wednesday from the other half of the Company. That smoothed matters over for the time being, but the next morning came and no cheque arrived. Again the proprietor appeared worried, and little wonder for we had been having four square meals a day. The evening we had about twenty people in, and the show was a decided "frost". After the performance was over the landlord said that we should have no supper until we paid him, but we told him that the cheque was certain to arrive on the Thursday morning and that if he didn't give us something to eat we would not pay a penny piece. So we got our supper alright. The next day we held a consultation between ourselves and it was decided that we should throw out all of our parcels from a little back window which looked over some waste ground and then go across the fields to another little village about two miles away and "show" there. The Manager was supposed to go down to the Post Office for the letter containing the cheque but in reality he slipped off to the other village to arrange for the room in which we were to perform on the Friday and Saturday nights. I was told to engage the landlord in conversation while the other members of the Co. were carrying away their goods and chattels. I found him in the slaughterhouse engaged in killing a pig and I made enquiries as to the modus operandi of the killing whilst my friends were thus busily engaged. At a given signal that everything was alright I sauntered away and found my "props" which consisted of two large bags where they had been left under a hedge with one of the Company looking after them. So off we started and after many rests arrived at the village and met our manager who told us everything was right and the room engaged for the two nights and that we were to live in the house. Of course Thursday being our day of removal we did not work that night but made preparations for the two ensuing evenings. We had a packed "house" on the Friday night and did well. At this time I was singing comic songs as well as doing my ventriloquial show. My turn was last, the reason given me therefore that the people might be sent away in a good humour. All went well until the Saturday morning when the landlord from the first place who had heard we were acting at the other town came over for his money. The only thing we had to do was keep him away from the present "boss" this we did by promising that if he kept quiet we would give him every penny that was taken on Saturday night and that he could come over and receive it. He was satisfied. The same morning two friends of mine arrived from Sheffield and insisted upon my accompanying them back that day, but I told them I would stay the night and return on the Sunday for I had not received my salary. So it was arranged. My friends and I enjoyed ourselves all the day and in the evening they went away and I saw them off at the station. It so happened that I did not turn up at the show until after nine o'clock. The others had done all they could to amuse the audience and the manager had announced that he had just received a wire from me to say I would be there in half an hour, in reply to which a man in the audience had risen and stated that there was no telegraph office at the place he had mentioned the wire had been sent from, but just as they were arguing the point in I walked and that settled everything. I told the audience that I had been delayed but that if they would accept a little music from the orchestra (which I may say consisted of but one player, a blind fiddler) while I got ready I would endeavour to entertain them. During my performance I was told in a whisper that the moment I had finished my show the lights would go out, and that I had better put the "props" I was not using into my bags so that I could pick them up quickly and run for it. This I did and everything went alright. I ought to mention that the landlord from the other town was a member of the audience, and was waiting for his money. The moment I had concluded out went the lights and there was of course an uproar. I pounced upon my few things and out I slipped at the back with the others. Our manager had been out and bought two loaves of bread a pound of cheese and a quart bottle of ale, so we started on the road and walked back to Sheffield. Half way on the journey a halt was called and we sat down on the way side, it being a lovely moonlit night and shared the provisions, I can tell you we thoroughly enjoyed them too. Then we divided the spoil, I mean the salary. And each received one shilling and sixpence, so I returned to Sheffield a sadder but wiser youth. I recollect another "Barnstorming" or village hunting experience which may be worth recording. I joined a troupe of strolling players who style themselves the Liverpool Dramatic Co., On this case also fares were to be paid after joining. We opened at Masbro on the Saturday night for one night only and there was a very good house. The piece we played was christened or re-christened I should say - The Streets of Liverpool or the Steam Forge Hammer. I have reason to remember the second title for in one of the scenes I had to hold my head underneath the mighty hammer, and in the struggle that proceeded this someone touched the piece of string which held the mighty Forge Hammer in its position, and before my head could be placed under, down came the whole contrivance, a mass of black canvas and cardboard. Right - An article from the Sunday Times of February the 5th 1899 on one of Frank Travis's later appearances in Australia - Courtesy Justine Sara. This of course gave the entire bag of tricks away to the great delight of the "Gods" who showed their appreciation by hisses, catcalls and groans. The performance had to be brought to an abrupt conclusion, the "Queen" was played by the grand orchestra of three musicians and we all went round to find the manager for our nights money, but to our intense surprise he had vanished and had taken with him the nights takings leaving the Liverpool Dramatic Co., to do the best they could for themselves and carry their own "props" back to Sheffield. Just one more anecdote of another "barnstorming" crowd. I joined a Company who were travelling through Yorkshire working the little villages with a small "fit up". The numerical strength of the company was five all told and the terms were a share of everything that came in, if anything, well we shared that. Most of the journeys were made on foot and the "fit up" and luggage went by road too on a cart, and if the journey was a long one we used to ride on the wagon. I recollect we were very hard up one week and were depending on Saturday Night's takings for a bit of "Boiling piece" for our Sunday Dinner, but unfortunately we had but a few people in on the last night of the week and had only enough to pay for bread, cheese, and beer after the show, but we resolved we would have something for Sunday so we brought half a stone of flour and we carried it by turns all the way to our lodgings which were in a village about four miles distant from the Hall where we were working at. We started at midnight and eventually reached our lodgings when we lit a fire, took some flour and mixed some water with it and baked some cakes in the frying pan. The Prince of Wales never enjoyed his supper better than we did that night or rather early morning. Next we went to Driffield and there the business proved so bad that the landlord claimed the "fit up" for rent so without "fit up" or money what were we to do? We had booked the Theatre at Bridlington to go on to next where no "fit up" would be needed, but what about the fares? It was arranged though somehow, part of the fares being raised - goodness only knows how - and the other members of the Company travelling on their luggage. Of course the land ladies had the same old tale told to them viz:- that the money would be sent on the next week without fail. As I said the landlord had seized the "fit up" but not my figures for I had taken them to my rooms each night. It was at this stage of the game I determined to sever my connection with the Dramatic Co., and try my luck solo, so as I could not get any money from them I said I would join them in Bridlington, I thought if I can only get there I may be alright, but not with the great Dramatic Co. They left early in the week and were to open on the coming Saturday night. I saw them depart at the station, and wished them "Bon Voyage" and off they went. I returned to my lodgings very unsettled in my mind as to what I should do to raise enough money to pay my Landlady. I sat down and put on my studying cap and after mature thought decided that I would work the smoke rooms in the hotels and public houses in the evenings. My performance was the Talking Hand, and this is how I did it. I painted my hand to resemble the face of an old lady and I flattered myself that I could do that to perfection for it did not matter how close up a person came to me, they could not perceive the slightest movement, the deception being complete. Night having come I started forth and I don't think I was ever more nervous in my life. The first room I went into was occupied by several old gentleman, I explained my case to them and told them I was left behind by the travelling Co. who had been performing at the Hall, and I wanted to obtain enough money to see me out of the town. I then drew out of my pocket a piece of Indian Ink and a little red chalk and made the face up and gave my show. It so amused them that I was paid well for my trouble. One of the two spectators kindly went with me to other rooms and introduced me as a living wonder to their friends at the different Hotels. One gentleman even took me home to give my entertainment to his family, whilst the landlord and his wife of one of the hotels I visited gave up their own bedroom for me for the night. When I woke up the next morning I found I was thirty shillings richer than the day before, so I settled up with my landlady, and then took the train to Bridlington. Arriving there in the afternoon I looked around for some lodgings and soon got two comfortable rooms at a cheap price, the season being over. The following day in the course of conversation with my landlady I happened to mention the name of some of my relations, and she knew them and told me that one of my Uncles had just died and that he had left some money to each of his nephews and nieces. The news nearly took my breath away but it was too late that day to make enquiries into the matter so I obtained the address and the next morning went to visit another Uncle of mine who was the executor. I made myself known and everything was alright. I saw my cousins and spent the day with them. On leaving the money was handed over to me and I came away with a light and merry heart. I wrote when I got back to my two sisters and they had their portion sent on. Then I ordered a big banquet at my lodgings and went out to find the Company. I soon found them and brought them back with me to the sumptuous spread and we kept up a jolly evening until the early hours of the morning. They drank my health and wished they had half my luck and at the same time they tried to persuade me to take over the management of the Co. and put in my capital, but I refused though much obliged for as the song says I had "ad some" but I promised to perform for them gratis on their opening night which I did, and that was my last night of Barnstorming. My first appearance before the public was in Manchester at a Music Hall known as Ben Lang's, which in those days was reckoned upon as being a large place. It was pulled down many years ago and one of those palatial Hotels now to be seen in all great cities is on the site. I also appeared at the old Grecian in Deansgate in the same city and that too is but a memory of the past and a pleasant memory withal. I also worked at the Polytechnic at Salford which was owned at the time by the Sisters Byron, a music hall turn of some note in the sixties and another place I performed at with success was Pitney Westons Music Hall at Bolton, he had a great reputation as an actor, he was just as much at home as a clown as when he was playing Hamlet, very versatile. 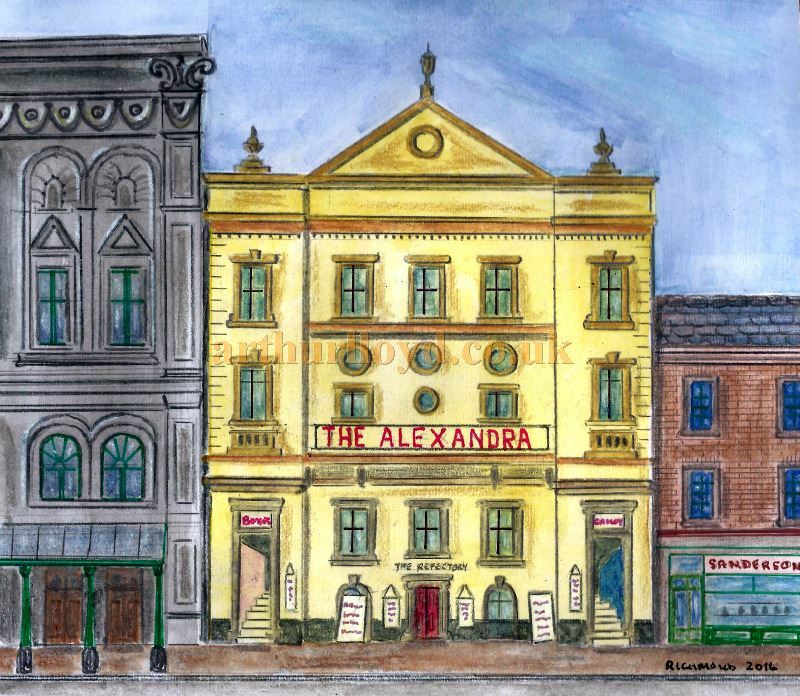 Above - A Watercolour showing the original 1865 Alexandra Theatre, Manchester - By George Richmond August 2016. The painting has been created from a photograph in the book 'Red Plush and Gilt' by Joyce Knowlson. 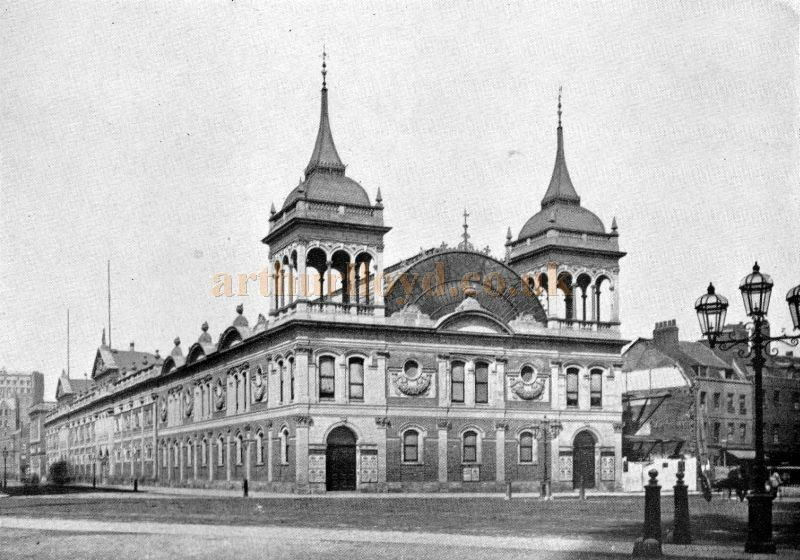 The Theatre later became the Folly Theatre, and then the Tivoli Theatre in 1897. Click for an Index to all of George Richmond's Paintings on this site. 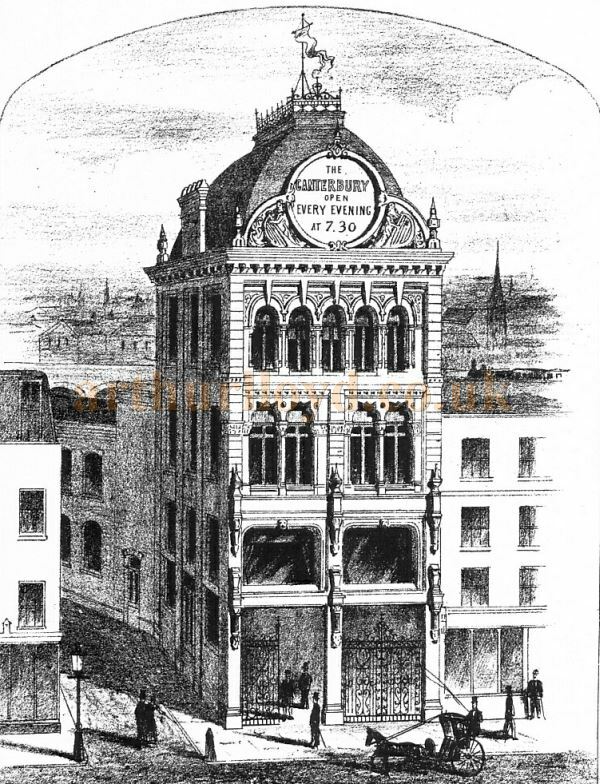 While working at the Polytechnic, Salford, Miss Georgina Smithson a very clever and popular vocalist was one of the star serio comics of the day, and some years afterwards I was engaged at the Alexandra Music Hall in Peter Street, Manchester (shown above) which afterwards was called - [ The Folly Theatre ] - at the same time as the great George Leybourne who was then at the height of his fame and the idol of the people. Right - An article on Lieutenant Frank Travis from the Referee of Wednesday the 8th of February 1899 - Courtesy Justine Sara. When I first appeared at Sheffield I was a member of the same company at Mrs Parsonages' "Fleur de Lys" Music Hall in Angel Street as Herr Shalkenbach with his wonderful Electric Organ. His contrivances were really marvellous and held the audience spellbound. He was fond of a bit fun too and used to have a coil placed to his chair near the Chairmans Table, who always reserved that seat for some particular friend, and in the middle of the Professors performance the gentleman who occupied the chair would jump up suddenly startled out of his wits just as if an earthquake had shaken the ground beneath him. Then those in the know would smile loudly. My first appearance in a Music Hall in London was about eighteen years ago when I opened at the Raglan in Theobolds Road, Holborn, which was then owned by Mr. Hart. I was only engaged for one week, but after the first night was secured for three months. Pat Feeney was there at the time and was a great favourite and other popular artistes were Misses Kate Castleton, Ange Pelham and Kate Everleigh, Mr and Mrs Sam Dudley, Mr. Arthur Roberts, Mr. Will Riley who was singing the "Damned Scamp" Mr. George Leyboune, whose chief song at the time was "Who's coming out for a midnight Ramble" and others, and Mr. Tom Calton was the Chairman. After I had been in the Music Halls for about four years I accepted an engagement which was my first at a recognised theatre, at the Theatre Royal, Chesterfield. I was to play small parts and give my entertainment between the acts. I went for one week but my success was so great that I stayed seven. Though engaged for Utility I used to take any part that was allotted me, and we used to play six or seven Dramas in a week, so I had plenty of work, but I enjoyed it. The Lessee of the Theatre was Mr. Beaumont Kelly, and it was there that I met my wife who was his sister in law. She was playing walking lady parts at the Theatre. After my engagement at Chesterfield was over I went to Wellington Hall, Douglas, Isle of Man, where I played in farces, ballets, and gave my entertainment as well. When I returned to Liverpool I went back on the Halls again, my next engagement being at the Casino, Bevington Bush, Liverpool, where they had two houses at night and the Alhambra where they had the same. It was there that I had my first Benefit, Friday nights were set apart for Benefits but in truth the only person who benefitted was the proprietor. In order to try and persuade the people to come in comic singing contests were organised for a purse of silver (2/6) and the following fair like attractions were provided. There was sometimes a greasy pole to be walked or as a change the following competition was given. A pail would be filled with flour and coins thrown into it. The hands of those entering were tied behind them, so that they had to put their heads in to take out the coins by the mouth. Now the organisers of the affair used craftily to put treacle underneath the flour so that when the faces had been put into the flour their aspect when they were again visible can be better imagined than described. Another contest was Hot Dumpling Eating. In this a line was hung across the stage on which which were hung dumplings covered over with treacle. Then the competitors would stand in a row with their hands tied behind them, and when the dumplings had been made to swing the prize wishers would leap up at them and catch them in their mouths. The first that finished his dumpling gained the prize. After a stay in the Halls of about two years I accepted an engagement to join Mr. Frank Fuller and remained with him for eighteen months. We toured with a good old fashioned melodrama Matt Graves, in which I appeared besides giving my ventriloquial show. Mr. Fuller and I parted on the best of terms and I joined Miss Sarah Thorne's pantomime Company. I played Shiversahkes, the first low comedy part in Jack the Giant Killer. After this tour I returned to the to the Halls until the following Christmas when I was re-engaged by Miss Thorne to play one of the ugly sisters in Cinderella and Harlequin in the comic scenes. During this engagement at the Theatre Royal, Margate, I had a very narrow escape while performing my part a Harlequin. 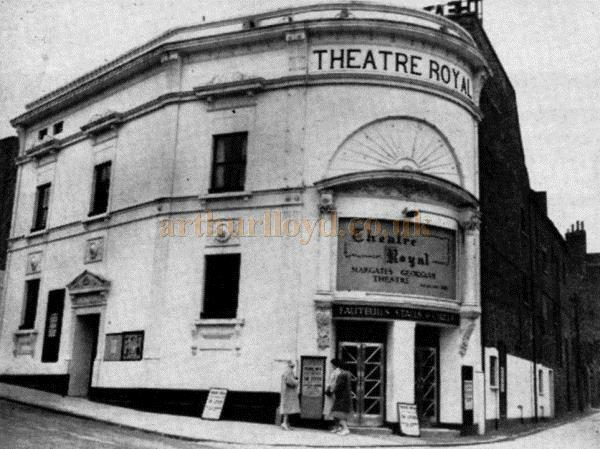 Right - The Theatre Royal, Margate - Theatre World, June 1962 - Courtesy Maurice Poole. As usual I went through my Trap which was a clocks face, and I of course expected to be caught as usual by the stage hands, but there was not a soul there and I went crash up against a wall which was close behind where we had fixed the trap, I fell on the stage on the back of my neck with such a noise that a lady heard it in one of the boxes and sent round to see if I was alright. I could not finish my part that night but the next evening I managed though in great pain to through the performance. After this second engagement with Miss Thorne I rejoined Mr. Kelly's Dramatic Co. and toured the provinces, that finished I returned to the Halls where I have remained ever since. It must be twenty five years ago - how fast time flies since I appeared at the Malacoff Music Hall, Cleveland Square, Liverpool. It was owned by Dan Lowry the father of the present Managing Director of the Star Music Hall Co. Dublin and the Empire Co. Belfast. My princely emolument there was 25s a week, and for that I had to do two shows a night. But it was not just a six night engagement, one could stay for as long a period as one liked. It was chiefly frequented by sailors and others of that class. About the same time I was working also at the Oxford Music Hall in Lime Street, now the American Bar, which was next door to the St. James Hall at the Constellation in Paradise Street, and the Casino and Alhambra all in Liverpool and all now done away with. 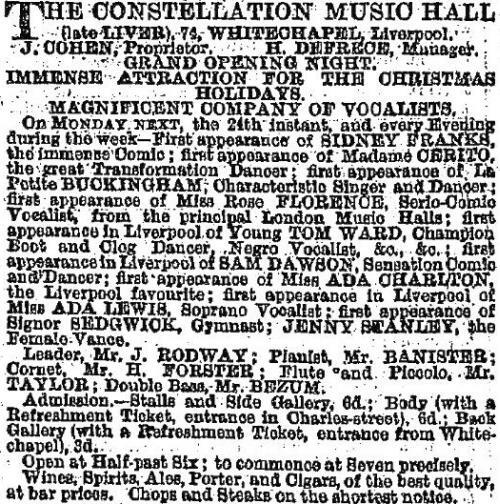 Right - An advertisement for the opening of the Constellation Music Hall, Liverpool - From the Liverpool Mercury, 21st of December 1866. I next crossed over to Ireland and opened at the Star Music Hall in Crampton Court, Dublin on the site of which the new Star was afterwards built (now the Empire). It was formerly owned by a Mrs Connell, and was known among the boys as "Mother Connells". I was a very "warm shop" to use professional parlance - in those days if the audience did not like the artiste's turn they used to throw bottles, or drinking cans, or anything that might be handy at the unfortunate performer. Mother Connell once engaged a couple of trapeze artistes to appear at her Hall, but at the time she did not know anything whatever about aerial shows. The artistes arrived and went to the Hall to fix their apparatus they found the roof in a very rotten condition, this was naturally mentioned to the proprietress, her exact reply is worth recording "Well" she said "can't you fix the trapeze on the ground?". One night an artiste appeared on the stage to whom the audience took no fancy to, so they commenced to throw the first things they could find at the lady, and someone, whose aim could not have been as good as Buffalo Bills hurled a glass bottle from the gallery. This instead of hitting the artiste fell on the head of the unoffending pianist. Just at that moment he stooped down and knocked his head against the partition, this sent part of the bottle further in and it turned out a very serious accident - if accident one might call it. After that the Orchestra refused to play and kept to their determination not to go into their places until some alteration was made, so a cage was made at one end of the stage and in this the three musicians who constituted the orchestra were put, so anything thrown at the stage would not injure them. There was a Hall in Glasgow, called the Bear Pit where the entire stage was caged off so that the artistes could not be pulled off the stage by the boisterous young fellows who frequented the place. This establishment was in existence as late as ten years ago. My first visit to the Continent being engaged to appear at a Hall in Rotterdam, and I had undertaken to give my performance half in English and half in German, but to tell the honest truth I knew no more of the German language as I do today the Sanskrit Chinese. However, I determined to trust to luck, and departed from Harwich and duly arrived at my destination. But my difficulties began at once for not being able to speak a single word I couldn't even say where I wanted to go. However with the assistance of the porters and some waiters who knew a few words of English I was driven to the Hall. The evening came and I found that I had to do two different shows each night. I did my entertainment with my figures first, and gave it in English. I went without a hand and when I left the stage I felt so downcast and ashamed that I refused to show myself outside the dressing room. But I managed to pluck up courage when the time came for me to appear again though I determined to struggle through somehow and get back to England the next day. I then went on and gave my imitations of animals and that show went just as successfully as the other one had gone badly. After the performance I had a chat with the proprietress who could speak a little of my own language and she advised me strongly to give my animal imitations first, and added you must educate the audience up to your other show but if only you could speak a word or two of German how much better it would go, I saw how much truth there was in this and when on my return to my lodgings I found there were two German Artistes living there who could speak English tolerably well I besought them earnestly to teach me just enough of their language to pull me through my performance. They proved most kind and obliging. Every day they used to teach me some joke or story in German and these I repeated as well as I could on the stage to the immense delight of the audience who seemed to consider my bad German the funniest thing in the world. I used to work my little figure on my knee at the time and I worked the alphabet with him which was very funny, then there was a large clock at the other end of the Hall and as I was working the clock stuck 12, and the boy on my knee after each strike imitated the cuckoo. My contract for this Hall had been made for one month and by the end of that time I managed to give my entire performance in German so my trip to Holland which looked like being so dire a failure was so successful that I remained in that country for two years, and only left owing to the dampness of the climate disagreeing with my constitution. Before leaving Holland, to recount my experiences in other countries in Europe, I will tell the story of how my wife became a lady ventriloquist. When I was working in Amsterdam at the Cafe Moulder I was taken seriously ill with an attack of bronchitis, and had to return to England and was for several weeks nursed at the Alexandra Park Hospital. But in about two months time I was alright again, and it crossed my mind that if I could bring out my wife (she had always been a good mimic) it would be less strain on me and would also bring grist to our mill. So I started to teach her and after a years hard work I was able to bring out my wife as "Madeline Rosa" the only lady ventriloquist in the work. 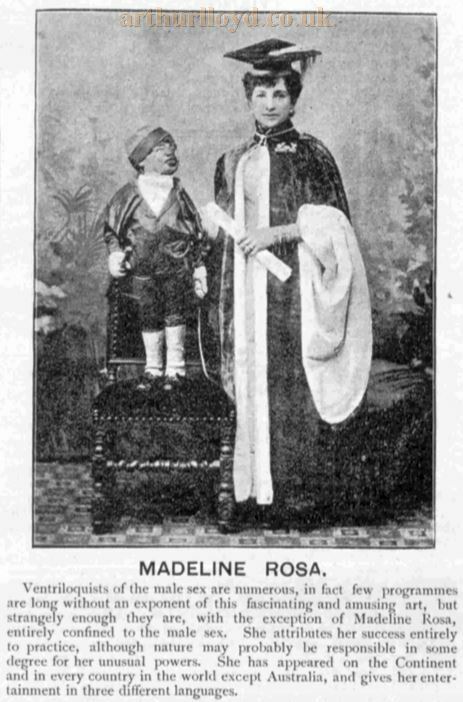 Right - A photograph and Article on Madeline Rosa - From the Music Hall and Theatre Review of Friday the 23rd of December 1892 - Courtesy Justine Sara. I returned to Holland alone and told the proprietor that during my stay in England I had discovered one of the greatest novelties of the age in the shape of a lady ventriloquist and that if he wanted the show he could have it at a price, if he wouldn't agree I would try the other halls, but I said he would be foolish to miss such a chance as the lady was my wife and we could work together and defy the other managers. In a few days he gave me his answer which was "Yes" so I sent over for my wife and she duly arrived. Great preparations were made and on her opening night the Hall was crowded. The novelty proved a great success but two or three days later the Manager came to me and said "Travis, do you know the audience scarcely believe that your wife does any ventriloquism, they think that it is you who do it for her instead" and he added that he himself was of the same belief. I thereupon proposed to him that during her performance I would leave the building and sit at the Bar outside, in fact I would do anything they liked in order to convince them and I did this every night for a long time until I had thus proved to the audience that I had nothing whatever to do with my wife's performance, but that she could ventriloquise just as well as I could. Business continued wonderfully good for about eight weeks and then we had to leave and go to the Walhalla Theatre, Berlin, it was at the Theatre Walhalla in Berlin that I had £25.0.0d weekly for three months, my first appearance in Germany, I left a great many friends in Holland and before I departed I was given a benefit and received on the occasion several valuable presents. Before I returned to England, I travelled through Germany, Belgium, Saxony, Hungary, Austria, France, and Spain, and the salaries I received on the Continent were the largest I had ever received. I gave my entertainment in German or in French. During this tour I had many experiences, some of a humorous nature, while others were most unpleasant. Here is one of the former. In a number of the towns I had visited there had never been a ventriloquist before, and it was a long time before the audience comprehended the business. They thought the figures were real and that it was a fraud my pretending to give them voice. In order to try and undeceive them I used to take my figure to pieces, and hand the heads round for inspection. The droll experience mentioned occurred in a music hall where it was the custom, as it is in many places abroad - to present the performers with a ticket which entitled the possessor a free drink at the bar. It was worth either sixpence or a shilling according to the salary received. It happened that on the first night of my engagement the attendant whose duty it was to dole out the refreshment tickets, gave me seven, I could not understand it exactly, but of course I took the tickets. On the second night the man gave me seven again, and then it dawned on me that I was receiving one for each of my "Company" in other words my figures. Another artist who had seen me take the tickets explained the matter to the man who came to me in a great rage and wanted me to pay him back the extra money. He thought my figures were alive. I had rather an anxious time of it when I first opened at the Great Fair at Leipzig. My entertainment was received with a veritable storm of hisses, and on the second night it was greeted in a similar manner. The next morning the proprietor said he wished to see me and on my going to his office he told me the audience considered that the show I gave was nothing but a fraud and that there were speaking tubes from the back or side of the mouths of the figures. The proprietor himself said that he did not believe what they said but knew it was a clever ventriloquial performance. He then said that as far as success in a monetary sense was concerned he was quite satisfied, and so he ought to have been for the rumour that I was nothing less than a swindler seemed to attract numbers to come and see for themselves. But the proprietor added that he was afraid of a riot occurring and that the audience might do a great deal of damage. So after consulting together we decided to appoint a committee from the audience on the next night, and this we did, and I gave my entertainment with a semi - circle of local notabilities behind me who after a careful scrutiny of my apparatus and figures came forward and vouched for the genuineness of the show. From that time forth I was greeted at the close of my performance with enthusiastic cheers. I stayed in Paris on my first visit for a period of thirteen months, three at the Folies Bergère, three at the Cirque d'Été and three at the Cirque d'Hiver. The remaining four months I gave drawing entertainments at all the most fashionable Parisian Salons. I was invited on one occasion to appear at the annual gathering of the Press Club there, and after my performance was asked to accept three hundred francs "as a favour" for attending. I appeared before a number of distinguished folk while in Paris, amongst others the Princess Mathilde, the Duke and Duchess of Hohenlohe, President Greriery, the Ambassador of Holland, the Duke Alexis of Russia, the salon of Sarah Bernhart, and the Baron and Baroness Erlanger. At the house of the last named I performed to an audience of seven only, the family being in mourning at the time but nevertheless I met with exceptional success. The Baroness could hardly believe her senses and insisted upon herself examining the figures to make sure that I did not resort to trickery of any kind. When I saw how dubious she still remained I decided to give her further proof of my ventriloquial powers, so I picked out a page boy standing in the room and learning that he could not speak a word of English, I took his upper and lower lips between my fingers so as to work them in time and catching the accent of the boy made him sing a verse of an English song in English. This convinced everyone present that I gave a genuine show and added not a little to my reputation and popularity in the merry capital of La Belle France. An amusing incident occurred during my engagement at the Folies Bergère. I had been there about two months, and it was my second visit when the management announced that they had secured the greatest novelty ever seen in Paris, viz -"L 'Homme Cannon." On the opening night of the new attraction, which preceded my act so that I was able to witness it from the side of the stage. The "strong man" went through a clever show of feats of strength, this over the novelty was announced. A large cannon was then brought on the stage, a cannon ball and a charge of powder were next produced and these were handed around the audience who were in the stalls for inspection who examined them and stated that they were alright. A soldier then marched on the stage, and charges the cannon, while doing this the performer fastened on to each wrist a large piece of leather behind which he clasps his hands so that when the ball from the cannon strikes his hand it would not be possible for it to go through his fingers. He stood at a distance of about two feet from the cannon's mouth, and then gave the word "Fire" the soldier touched the fuse and bang the shot was fired and the performer caught it. There was a moment of dead silence, then the audience burst forth into a frantic burst of prolonged cheers. The show was the talk of all Paris the next day. Holtum "The Cannon Ball King" used to catch a cannon ball but at a good distance away. The reader can imagine the force with which the ball would come from a cannon when one is standing 24 inches from the mouth. Well, the performance was repeated each night to the same chorus of applause for four or five evenings when I was standing at the side of the stage as usual as I had to follow up immediately after the act, I saw the whole thing. The cannon was wheeled on as before, the soldier touched the fuse, there was a loud report but no ball came out. There was an awful silence during which the performer looked first at the soldier, then at the cannon, then at his hands. All this took only an instant and then the audience burst out in one shout of laughter, and then commenced the shout "Trick" and hissed and yelled and whistled. Next they called for the manager but he did not come. The performer slunk out at the back and was seen no more that night. Of course the trick was a spring in the cannon that caused the ball to be thrown out. The audience were so furious to think that they had been swindled that they were determined that the performance should not go on and when I gave my act they were stamping and shouting and calling for the manager all the while I am sure never heard a word I said. I need not say that the performance was quickly brought to a close. "L 'Homme Cannon" did not appear the next night. I have in the course of my travels experienced all manner of untoward and unpleasant situations, but none ever equalled the occurrence I met with at Bordeaux which might have proved a very serious matter indeed. 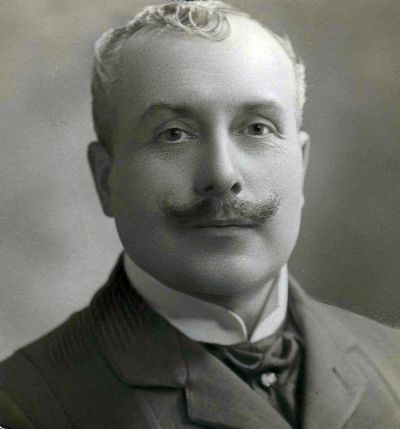 Mr Boaz, the director of the Folies Bergère, Bordeaux, paid salaries in accordance with the French custom every fortnight. On one pay day a friend and myself were having a game of billiards in a cafe facing the stage door. When we had finished our game we strolled across the lane to take our turn to go into the office. There were a large number of people waiting and just in front of us were several gentleman of the orchestra. So with a strong expletive, I said to my friend "Lets go over to the cafe again until these men get paid". Standing close by me at the moment was one of the orchestra who could speak a few words of English, and he followed us over to the cafe and asked me what I meant by insulting Frenchmen by my remark. Of course I endeavoured to explain that the word was not the same as he thought, and that I had not meant to insult any of his countrymen. But no - he would not understand and began to get angry, and made so much noise that the landlord came in and taking hold of the musician by the neck and legs and threw him into the street. When we thought the affair was over and the excitement had simmered down we went over and got our money. The evening came and the curtain went up for my act. The moment I appeared on stage I heard one or two hisses from the orchestra. For the moment I was dumbfounded, then it flashed through my brain that it was all owing to the dispute that had taken place in the afternoon. I tried to explain the matter to the audience, and then a gentleman seated in the stalls near the orchestra, who was the worse for drink, got up and tried to make a speech. I had my little boy figure on my knee, and the boy told him to sit down, or words to that effect. He would not so the attendants in front came and took him out. All this time the audience were impatient and noisey and soon there was quite a disturbance. So I finished my act as quickly as possible and the other artistes went on. The next day the affair was all over the town, and everyone told everyone else that I had insulted the French people. The manager said that trouble was brewing and warned me, he also had a number of extra police about the Hall ready in case of emergency. I should mention that the noisey gentleman who was thrown out was a student. Well, the evening came and the doors were opened. The house began to fill rapidly and when nearly full in walked a large body of students with red caps on their heads and big sticks on their shoulders. They marched about in single file all over the theatre which was by that time packed to suffocation. Two student friends of mine came round to me behind stage and said that there would be a riot if I did not apologise to the audience which they advised me to do. The performance began but not a single "turn" did the audience approve of. Then my act was announced. During the fixing of the stage there was a deathlike silence, the Hall might have been empty but when the orchestra struck up and the curtain raised and I made my appearance then the row and noise was deafening. Everyone stood up, ladies fainted, children screamed, and the men shouted, "Apologise, Apologise". Meanwhile I stood in the centre of the stage with my arms folded. The Director who was in a private box rang vehemently for the curtain to be lowered, but the stage manager seized with nervousness had run away. Standing at the wings were the ballet ladies partly dressed, some crying and all frightened and wondering how it would end. At length I got tired of standing, so I sat down on the edge of the table, then someone threw a stool (one of the little wooden stools that the ladies were supplied with to rest their feet on) at me, but it missed my head and hit a boy that I had on the stage to assist me. I thereupon considered it would be better to try and put a stop to the disturbance, so I walked forward towards the footlights and held up my hands and when a little quiet had been given asked the audience what they wanted from me. They insisted upon my apologising for insulting the French nation. I replied that in the first place I had never insulted the French, and secondly I would not apologise for I was an Englishman and would never apologise to a Frenchman. When I said that I had only just time to get off the stage before the audience and the students, being the ringleaders, threw on the stage everything they could possibly lay their hands on, and all my figures and stage fittings were smashed to atoms. Meanwhile I had rushed out of the door at the back and raced home as fast as I could without even my hat. I heard afterwards that after my departure there was a riot, the audience fought amongst themselves, the theatre had to be emptied and then there ensued a big fight outside in the street and 17 students were arrested and taken to the police station. I had not been home above an hour when the Chief of Police called on me, and told me I must leave by the six o'clock train in the morning or he would not be answerable for my life. I need scarcely say I was one of the passengers on that train. The next evening, so I was told, the theatre could have been filled twice over, for everybody wanted to see the Englishman who had set the French Republic at defiance. I have never been in Bordeaux since, although I have had very good offers. Above - A photograph of the Royal Aquarium - From 'The Face Of London' by Harold P. Clunn 1956. After my return from the Continent I retired from the profession for a while and the manner of my going back to the business was in this wise. I was one day introduced to Mr. Richard Warner, now the leading Variety Agent in England, America and Europe. One day I was chatting to him at York Corner, Waterloo Road, a great rendezvous for the performers (profession) when he said to me "Frank why don't you start to work again. You possess wonderful talent as a ventriloquist why should you hide it away from the public. If you like you can open at the Aquarium (shown above) this afternoon". Right - A Royal Aquarium Programme from January 8th 1890 (Printed on silk) - Kindly donated by Mr. John Moffatt. After a deal of persuasion I said I would, so we took a cab to the Aquarium, arriving there about one. We saw the manager who said he had had a big disappointment a performer he expected not turning up, so he engaged me right away and I was to appear that afternoon about half past three. So being settled I drove home and picked out three of my figures, got out my wardrobe, music, etc., had everything prepared, sent for a cab, put the luggage in and the wardrobe inside and started for the Aquarium. I changed my clothes in the vehicle on the way and managed to get everything fixed just in time to go on at the time appointed. I found it very difficult to think of an English Act, after I had for so long been giving it in French and German. However, I must have been a success for when I came off the stage I had a contract for twelve weeks. I have continued at work ever since, and thanks to my energetic agent am never out of an engagement. I have made two trips, and most enjoyable one they were, over to America, each of them thirty six weeks in duration, I visited all the chief cities of the United States and also California. The American Variety Theatre differs very materially from those this side of the Atlantic. The performance commences at eight o'clock and by that time everyone is seated, and before the curtain rises every man present has his hat off and should there be anyone who forgot to do so, he would soon be reminded of his neglect by an attendant who walks about the theatre with a big club in his hand, and who is responsible for order being kept. The audience there go to see the performance and to enjoy it. Another difference is that no smoking is allowed in the auditorium. An item worthy of note, and worthy also in my opinion to be copied in England is that the American manager believe in opening the programme with one of their "best" turns, which naturally puts the audience in a good humour from the beginning of the evening. I like the way the American Variety Theatres are conducted both before and behind the curtain. The performance is a lightening one, no waits whatever. The stage manager stands at the wings with a whistle and the moment one artiste has finished, the next goes on. The conductor of the orchestra has all the music books laid open before in notation to save loss of time. The nearest approach to this kind of performance in London is that given by Mr. Graydon at the Middlesex. As regards to scenery on "the other side of the pend" they use a number of "flats" which are run on and off with a rapidity that is very surprising. On my last tour I worked at all the leading theatres and opera houses which are ever more comfortable still, there being some exceptionally magnificent theatres in the States. Some of the Theatres I performed at were the same that Sir Henry Irving and all the dramatic "Stars" visit. I return to fulfil an engagement in New York of twelve weeks in '96 at Hammerstein's New Theatre which cost six hundred thousand pounds to build, and is the largest building in the world. It comprises a Theatre, and Opera House, a roof garden, a circus and gardens all in one. During my travels in AMERICA I visited Salt Lake City, crossed over the Rocky Mountains, and performed all through the Wild West regions, the places where one reads stories of how the audience use their revolvers in a second to express their disapproval of anything they don't take a fancy to on the stage, I must say I never experienced anything of the kind, though I performed before many an audience comprised of nothing but cowboys and Indians. Such exciting episodes may have happened in years gone by but certainly it is a thing of the past, and the Western Audience is as good and appreciative as any I have met anywhere. I have had lots of chaff levelled at my head since I have been back as to how I fared in Salt Lake City and how many wives I captured whilst there. But all that business has died out and there is nothing very special nowadays about the Mormons any more than any other Americans. There is a severer law against Mormons having more than one wife, and though on the quiet a number of "Saints" do have half a dozen, some even a dozen, it has to be concealed and not talked about. The city is a large one, with boulevards of great length, it possesses a handsome theatre, and a Tabernacle which is said to be the largest building in the world without a single pillar to support the roof. The Mormons wear no special dress or costume to be distinguished from a "Gentile". There are papers published in the Town for both creeds. "Lieut. Frank Travis is a very versatile young man. A devotee of Science in an amateur way he has gone, naturally, into the quasi-scientific, partly mystic, researches attendant upon a study of the but lately acknowledged mysteries of hypnotism. Lieutenant Travis' delving in the realms of what has hitherto been considered occultism and consequently foolishness has been resultful, in as much as he has to a degree acquired the power of subordinating the wills of others, hypnotic subjects to his own. His experiments have excited no end of wonder and some amusement among his friends but his developments was not sufficient to serve the fun making purposes of the Lieutenant. So en route from Liverpool to New York on the Inman Liner "The New York" he took a confederate into his confidence and after three or four hours seclusion, the duo were well prepared to astonish the habitués of the smoking saloon of Captain Watkins floating palace. The confederate was Charlie Borani, a member of the same company as Travis. Equipped as they were with mutual understandings the two dropped into the saloon by different entrances and the wily Travis seating himself near some steamship acquaintances (English of course) proceeded to discourse upon the recent discoveries of the French Savants concerning the possibilities of the "sixth sense". One of the acquaintances, a staunch Briton with four clubs and two country houses on his carte de visite, doubted. The Lieutenant persisted. Borani was interested in the piquet game on the other side of the room. The ubiquitously - residenced wagerer, the Lieutenant, "took him" and by mutual agreement Borani was designated as the object of the experiment. Travis addressed him in a tone of command. Borani, insulted, arose to resent but stopped stony in his tracks, Travis said in the same tone of command "You are a dog - over the table quick" and Borani vaulted the card table at a bound. "you are dying, you are hurt, you must fall" continued Travis in his mandatory tone. Borani dropped stiff to the floor. "I say, thats brutal don't you know" excitedly exclaimed the Englishman, "He'll hurt himself falling that way, bring him about can't you?" Travis said he could and made a few magical passes, which restored the hypnotised Borani to his senses. The Englishman paid for the small bottle and three glasses were served instead of two as agreed. But he warily avoided Travis during the rest of the trip and was heard by Borani telling a friend "He's a dangerous sort of chap you know. He might as easily made him give up his money as do that jump". The enlightenment came to his bewildered mind only when Sandy Hook had been passed and the acquaintances of the pleasant week were about. - Pittsburg dispatch. (Pittsburg [Pa.]), 05 Oct. 1890. Chronicling America: Historic American Newspapers. Lib. of Congress. "Lieut. Travis once went very far North in search of sport, and one day set out with three or four companions to look for a bear. They finally sighted a very big white one, the first look of which was enough for the other members of the party, and they left Travis to face the bear alone. A lucky shot killed the monarch of the North and being anxious to obtain the skin the Lieut. propped the carcass against an iceberg, and was about to strip him of his coat when half a dozen savage Esquimaux surrounded him. Having put down his gun, he could offer no resistance, and his visitors were preparing to tie him up for roasting when a brilliant idea evolved itself. From the jaws of the bear came a few curses in good powerful Esquimaux, a sound of which almost frightened his captors out of their wits. The bear went on to order them to provide a sleigh to convey Travis with every care back to the ship. Wondering at the strange command they nevertheless obeyed and he was taken with every Esquimaux courtesy to where the vessel lay at anchor. Thereafter he was made an honorary member of the tribe and was installed into a high position among the Esquimaux Gods". Prior to my departure to America I was given a complimentary Benefit at the "Fox & Hounds" Hotel at Putney. Mr.G. A. Payne Managing Director of the Canterbury & Paragon (ltd) occupying the chair. Right - An early engraving showing the exterior of the Canterbury Music Hall, later the Canterbury Theatre. Presented to Lieut. Travis by a few friends at the Canterbury Theatre of Varieties, London previous to his departure for America. The Banquet was everything one could wish for and we all had a very jolly time. The company all wished me a successful trip and a safe return. I also had a great send off at the Liverpool Landing stage by members of the profession then in the city, I sailed by "The City of Rome"
I have in my time appeared before a large number of Royal Folk, and five years ago gave my entertainment before H.R.H. the Prince of Wales (later to be King Edward) and a distinguished company, I intermingled my show on that occasion with English, French, and German sayings and songs, and it was wonderfully successful and evidently much enjoyed by the aristocratic Royal present. I have worked a boy figure nearly since I began to use figures at all. He was originally a school boy, and my part of the programme was to teach him his alphabet which caused roars of laughter, I also worked heads fastened on brass rods. 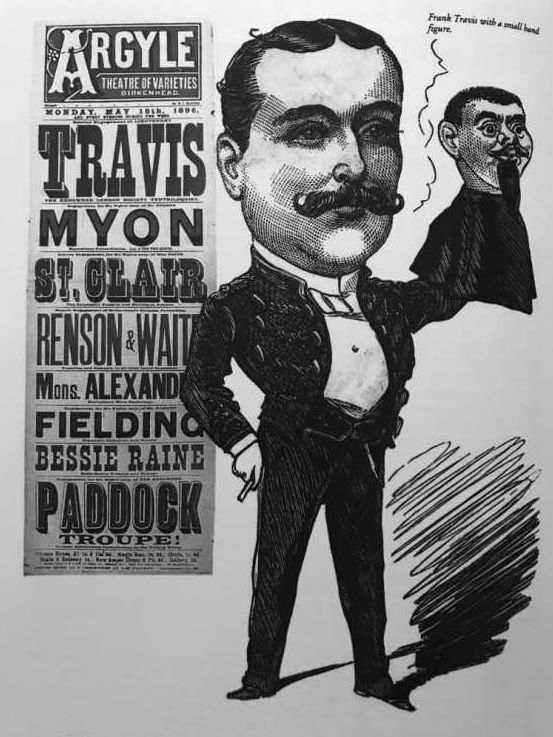 Right - An advertisement for Frank Travis from the Music Hall and Theatre Review, April 18th 1891. The second figure I ever worked was an old man head and an old man I have worked ever since. Up to about four years ago I used to have a "gag" with the boy figure who would scream out "He'll throw me down" I threatened to throw him into the orchestra if he would not be quiet. Afterwards I changed this to "Sticking here all night" which has proved one of the greatest hits in my entertainment and has met with the same reception wherever I have been. I have never used pneumatic tubes for working my figures as I have a better method viz., that of electricity. My figures cost me a great deal of money, but it is money well spent; one alone cost me no less than £60. Every hair in his head and his moustache was put on singly, and number of persons have spoken to him thinking he was alive. Above - Some of Lt. Frank Travis's Figures - Courtesy Justine Sara. The figures are made for me according to my instructions but are sent to me in the rough state and I add all the finishing touches myself. They have to be delicately treated and used with extreme care, and have even then to be frequently "touched up". I have several new, and I believe novel creations which I shall "spring upon" the public after my return from America next year. The mouth movement I use is my own secret. If anyone watches my figures carefully when at work he will observe not a mere tremulous movement, but the lips open and close in the exact relation to the words I utter. I recollect two instances when the similitude to life of my figures caused members of the audience to exhibit signs of great anger. Once was when I was appearing in Liverpool. The reader will doubtless remember that in the course of my entertainment I smack the little boy figure and knock him about. One night a foreign sailor seated in the gallery became terribly excited over this supposed to be brutality, and pulling out a long knife and struggling to get at me said he would "go for me". He was eventually pacified by the audience but I was so upset, that I turned pale and felt so ill that I had to leave my performance unfinished that night. Something of a similar nature happened once at Brighton, and it was over the same bit of "business". All of a sudden an old lady among the audience rose from her seat and shouted very loudly "How can Christian mothers watch such an exhibition of cruelty" was something inexplicable to her. With this she marched with stately step out of the Hall, shaking her fist excitedly as she went. The incident created the greatest amusement amongst the audience. In our business nowadays it is necessary to be always on the look out for fresh feats and figures. It was thus that while thinking what novelty I could do that I determined to introduce a song from one of my figures and that during the song I would smoke a cigarette, and also drink a glass of water. I need scarcely tell anyone who had practiced the art of ventriloquism what a difficult feat this is, and it was not until after months and months of trying and persevering that I was able to produce it in public. The song I selected was "True till Death" which is a difficult song in itself, but a hundred times more so to sing ventriloquially, smoking and drinking at the same time. This is a feat I can fairly claim to be the original. It is quite remarkable how many persons who witness my "show" particularly those in the provinces are possessed of the implicit belief that my figures are in reality flesh and blood. Only a few weeks ago when I was working at the Empire, Newcastle on Tyne, the following incident occurred which gives further proof of the above statement. After I had introduced my old man figure, the doctor who is suffering from gout - I promised that I would give him a drink. Some few minutes later when I was working another figure, a man stood up in the audience and in a very plaintive tone of voice exclaimed "Now Travis give the old man the drink you promised him" I did not reply and there was a moments dead silence followed by a hearty voice of laughter when the audience realised that the individual who had spoken really thought that the figure was alive. 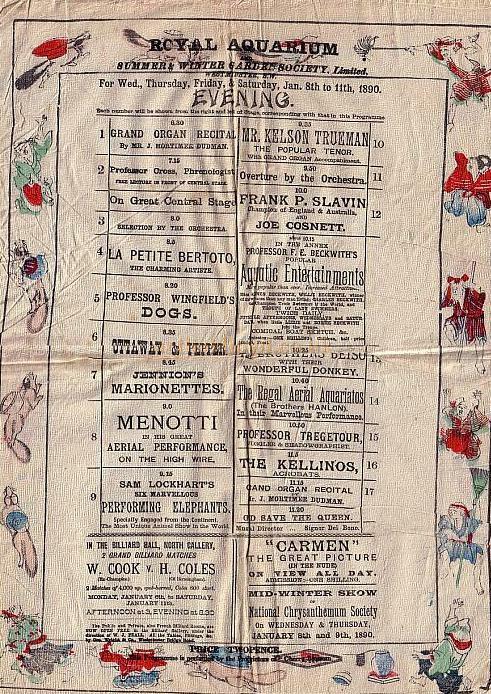 Right - An Empire Palace Newcastle Theatre Programme for July the 11th 1904, soon after the Theatre had been rebuilt by Frank Matcham. At the same theatre during the same engagement I was interrupted by a woman in the pit who shouted angrily "Don't hurt that poor little fellow", alluding of course to the boy figure on my knee. 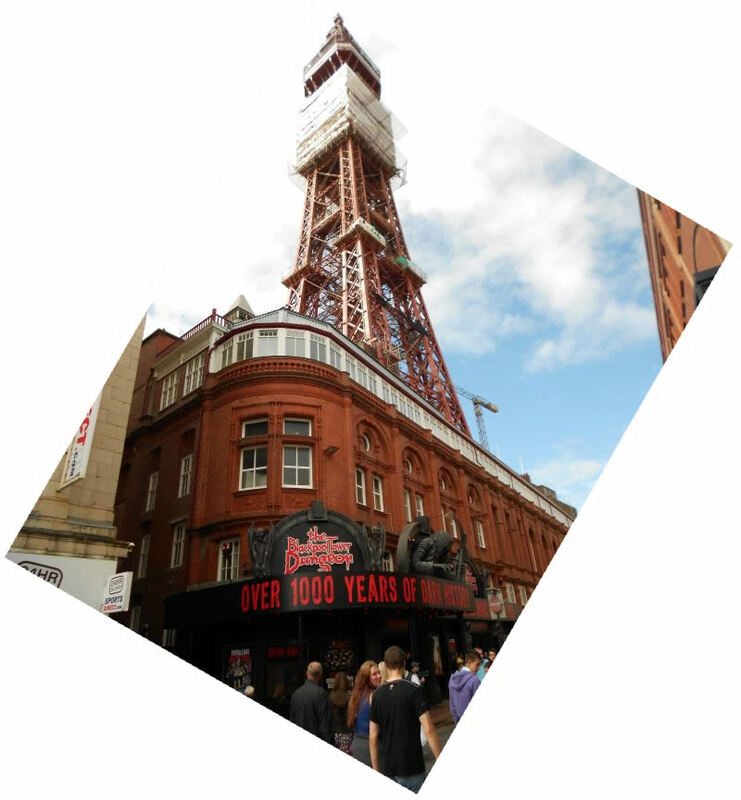 When I was engaged at the Tower, Blackpool (shown below), last summer the following incident occurred. Leading to my dressing room there was a long rather dark passage and I used to stand my figures there, so that the stage manager could place them into position to walk on. One afternoon I was alone in the room getting ready to appear when I heard a voice talking outside in the passage. I thought it was one of the stage hands, so for the moment did not take any notice, but there came a knock at the door. I opened it and saw a gentleman standing outside who presented his card to me and asked if I would give it to Mr. Nestor or Nestor and Brian, the gymnasts. I said I would as soon as they arrived. He thanked me and added he had been talking in the passage to an elderly gentleman, but he would not even answer him. Above - The Blackpool Tower, and entrance to the Tower Dungeons, formerly the Aquarium, during renovation works to the Tower in August 2012 - Photo M.L. As I came on the stage with my old man figure I saw Mr. Nestor talking to his friend. The latter started and turning to his companion said "Well if that doesn't beat Cockfighting. I had been talking to Travis' figure in the passage and asked him to give you my card, and I thought it was very funny he did not answer. For heavens sake don't tell Travis I've been making such a fool of myself." He saw that the laugh was against him and he quickly and silently left the building. When being interviewed by different members of the Fourth Estate for various journals a favourite question that has been put to me is the following "What is the most interesting audience that you have ever played before" So in order to answer this knotty point once and for ever I will state here my invariable reply to this query. The most curious and most interesting audience I have ever played to was at Liverpool many years ago now. I was performing at the Star Music Hall in that city when I was informed that the Mayor of Liverpool wished me to give an entertainment one evening at the Death and Dumb Institute. Of course I laughed at what I thought was a silly idea but after considerable persuasion I consented and went taking all my figures with me; they were delighted. 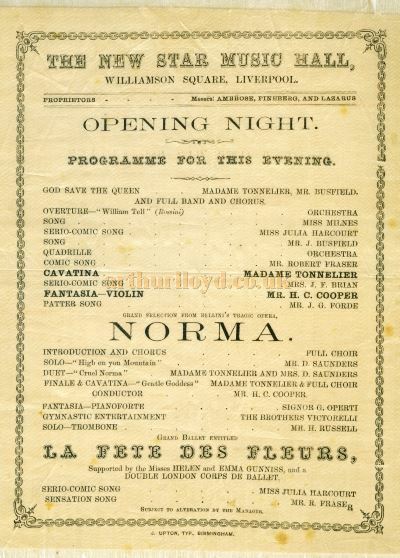 Right - A programme, printed on silk, for the opening night of the Star Music Hall, Williamson Square, Liverpool on the 26th of December 1866 - Courtesy Carol Shone. One of the teachers came up to me and asked to give the entertainment just as I always did. Then before I commenced the teachers stationed themselves in different parts of the Hall, one here, another there, and one on either side of me. As I spoke so did the teachers after me with their hands in signs and the children understood all the jokes. The success of the performance was so great that it was with the greatest difficulty that I could tear myself away but before I left I said a few words myself with my fingers, and that crowned everything. The Liverpool Mercury came out the following morning with a glowing account of Travis at the Deaf and Dumb school. Who has not read, and therefore enjoyed, that marvellous romance of Dumas; 'The Count of Monty Christo', who has not sympathised with Dante in his prison cell, who has not rejoiced at the downfall of the purse-proud Douglas and his abettor in crime the infamous Fernand. It is a book that may well be styled "a classic" and it is one of which I have always been most fond. So what was more natural than that when I was working at the Alcazar at Marseilles I should one day hire a boat and pay a visit to the celebrated castle Chateau D'If where for so long Dantes was supposed to have been imprisoned. I had during my dramatic career often played in the drama founded on the novel so I was doubly interested in the story. So I asked my friends to accompany me and we hired a boat and off we started. After a pleasant sail we arrived at the island and after some little difficulty we leapt onto the rocks, and made our way up to the Castle. I was much struck with the quaintness and picturesqueness of the lonely isle, with the frowning, forbidding walls of the prison its centrepiece. But after we had refreshed ourselves with a cooling drink we commenced to descend and examine the dungeons, but before doing so we were shown a curious fountain and bowl of Holy Water which were in the Courtyard. We then descended and examined the several cells until we came to the one that tradition has assigned to poor Edmond Dante's. In spite of the inner knowledge we all possessed that Duma's story was a tale and naught else, yet it was impossible not to become imbued with a kind of superstitious awe and a feeling of sadness that any man could be confined for so many long years in so gruesome and gloomy a cell. The guide next pointed out the supposed hole, which readers of the book will so well remember, that the old Abbe' Faria and Dantes made after such arduous and laborious work from Cell No.34 to Cell No.27 a distance of some 60 feet. While we were looking around and conversing with the guide one of my friends whispered to me "Travis now is your time to do something" I replied "All right I will". We had finished examining the hole and were about to leave the dungeon to visit the cell where the revolutionary Abbe' was supposed to have been confined when from the furthermost end of the narrow little room came a subdued but very distinct moan. I looked at the guide and he visibly paled. I enquired what it could be and he shook his head being scarcely able to speak with fright. A second after the groan was repeated, it sounded weird and unearthly, like a voice from the very grave, if one can imagine that. This time the man trembled with terror and my friends falling in with the joke "worked it up for me", to use a stage term, and we all appeared to be very frightened, I re-entered the cell, and the guide absolutely refused to and I put my head into the hole, and just as I emerged there came a heart piercing shriek. When I heard it I jumped out, and was soon on the other side of the dungeon door. We all made a rush for the steps, but the guide was there before us. He crossed himself and then ran up the stairs as fast as possible. When we arrived in the Courtyard there was the poor fellow seated on a long form as white as a sheet. It appeared that during our stay below some other visitors had arrived and they were questioning the guide as to what was the narration. He told them in a graphic and piteous manner that my friends could scarcely refrain from laughing, indeed one of them was so overcome with merriment that he had to laugh outright. He then explained to the guide and visitors that I was Mr. Travis the Ventriloquist from Alcazar. The man soon understood the affair and he opened his eyes wide and jumped on his feet. As we were getting into the boat to return I chanced to look around at him, and I shall always remember the look he gave me, it was anything but pleasant. However, we gave him a little soothing ointment in the shape of a few francs, and I believe in the end he was highly satisfied, although I don't think he is ever likely to forget the groans that ensued that day from the Ghost of Edmond Dante. When I was playing in San Francisco during my American Tour I had the pleasure of meeting Professor James, who was in his day one of the most celebrated Ventriloquists. Prof. Jester was I believe the very first to introduce the Talking Hand and he used to give the entertainment on board the Liverpool Ferry Boats, but James appeared on the scene very shortly after him. I met the latter behind the scenes of the Orpheum at 'Frisco and he was then a very old man with white flowing hair and almost blind through old age. He examined my figures with such minuteness and much interest and expressed himself as thunderstruck at the mechanical arrangements, and he was also he said highly delighted with the whole performance. I have in the foregoing pages alluded more than once to the numberless interviews with which I have been favoured by Members of the Press at different times in my career and I will now relate a story of a harmless joke that I practiced some little while ago upon a member of that great fraternity who had come to obtain a "copy" for a well known London Weekly. On his arrival at my house he was asked by my maid to wait for a few minutes in the drawing room as I was out and would shortly return. The venetian blinds were partly drawn and as it was towards evening this had the effect of making the room decidedly gloomy and ghostly. However there was sufficient light for the visitor to notice that there was several ladies and gentleman also awaiting the Lieutenants arrival, some lounging on the sofa and some seated on the chairs. The newcomer after politely saying "Good Evening" sat down to patiently await the arrival of his host. Not having been introduced to the remainder of the company did not care to join in their conversation which to his astonishment was all about himself. 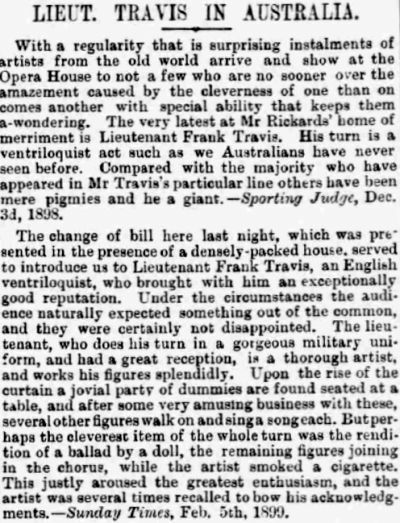 Right - An article from the Music Hall and Theatre review of the 23rd of December 1892 which backs up the story told here by Frank Travis - Courtesy Justine Sara. First an elderly gentleman who was evidently suffering from rheumatism or the gout and who by reason of his venerable age should have known better remarked to a well dressed foreigner apparently a Frenchman, by his side that the fresh arrival on the scene was "exceedingly scraggy" and then an ancient dame reclining on the sofa opposite joined in with "Very scraggy" and "oh what a squint he has". Various other unflattering compliments upon the journalists personal appearance were indulged until at last losing his temper rose to his feet and exclaiming that he had never met with such scandalous treatment before, and announced his intention of departing. To this a precocious youngster seated on the piano stool shouted "Do and the sooner the better". Of course the gentleman had seen through the trick but nevertheless he was making hurried strides in the direction of the door, when I appeared from behind a screen bursting with merriment. Going over to the window I pulled up the Venetians and then the perplexed pressman perceived that his peculiar reception had all been arranged for, the rude people being of course only my dummy figures. Lieut. Travis what do you drink? The question may appear to be a somewhat impertinent one, but nevertheless it is one that is often asked me, and it may interest aspiring amateur ventriloquists, if no one else, to learn what liquid refreshment of a nourishing nature I permit myself to indulge in. It is almost unnecessary to say that I have to be most particularly careful of my vocal cords just as though they were the delicate heirs of a millionaire. Therefore I have to be guarded in what I drink. The first thing in the morning before getting out of my virtuous couch I imbibe half a pint of hot water with the juice of a lemon squeezed in it and a pinch of salt thrown in. This I have found by experience to be a splendid tonic for the voice. I never drink tea or coffee as I find them injurious to the vocal chords but in their place I take a cup of cocoa without any milk or sugar. I never eat after four o'clock in the afternoon and at night take a glass of Scotch and Soda. This was recommended to me by the late Sir Morrell Mackenzie. I am very fond of a cigar but dare not smoke many as they are certainly not good for the voice, while cigarettes injure the throat terribly if too many are smoked. I will now proceed to tell my readers something of the art called ventriloquism, and give any who may desire to amuse their friends some practical hints as to the way to learn first whether they possess the necessary and essential qualities indispensable for the acquirement of the art, and should they be possessed of the same then explain the method by which they should exercise and practice those qualities in order to succeed in the art above their fellows. It is of very ancient origin though in those long bygone ages it was seldom practiced except by magicians and sooth sayers who recognised its power to thus deceive the populace even while they understood not its proper cultivation nor indeed even its cause. The lore of the antiquarian abounds with examples of the manner in which it was exercised, and but one of these need suffice to demonstrate its effectiveness. It is almost certain that the oracle at Delphi to which the Grecians of old repaired and in such vast numbers to learn the "wisdom of the gods" was but an exhibition, mystifying no doubt, but probably indifferently and clumsily worked, of the art of Ventriloquism as arranged for their own benefit and to impose on the ignorant minds of their believers by the high Priests of Apollo and his companion deities. From those early times up to the present day this apparently supernatural art has been practiced. - Francis Henry Thackeray 1854-1931. I have transcribed the above as accurately as possible, only changing obvious spelling mistakes and typos, if unsure I have left it as he wrote it. I have written it as he had, 27 type written pages handed down through our family, ending abruptly as it does above, unsure if the rest was lost or if this was all that was written. I have verified most places / names / venues / dates etc through research and newspapers. It remains a unique historical piece from the 1890's. - Justine Sara. Justine Sara is the Great Granddaughter of Francis Henry Thackeray, AKA Frank travis, and having transcribed Frank's memoirs she very kindly sent them along for inclusion on arthurlloyd.co.uk in November 2018.